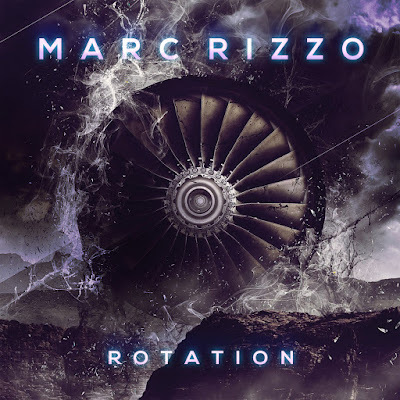 SOULFLY/CAVALERA CONSPIRACY guitarist Marc Rizzo has set the release date for his new LP ROTATION, in stores March 30th via Combat Records/EMP LABEL GROUP/AMPED in North America, and COMBAT/SPV in Europe. ROTATION is the 4th solo release for Rizzo, following 2004’s COLOSSAL MYOPIA, 2006’s THE ULTIMATE DEVOTION (both released by legendary shred label SHRAPNEL), and the independently released 2010 LP LEGIONNAIRE. Produced by Chris “Zeuss” Harris (Hatebreed, Soulfly, Rob Zombie, Chimaira), and featuring cover art by Melody Myers (Escape The Fate), ROTATION is a blistering showcase of Rizzo’s pummeling eclectic diversity, showcased on album tracks including “Spectral Intensities”, “Thrash Boogie”, and title track “Rotation”, combining Rizzo’s penchant for pummeling, low-end riffs, with thrash-intensive leads and heavy Latin flavor. Originally a member of New Jersey latin-metal favourites ILL NINO, appearing on their classic 2001 Roadrunner release REVOLUTION REVOLUCION, and the 2003 follow-up CONFESSION, Rizzo joined SOULFLY in 2004 and has since appeared on all subsequent Soulfly records including; PROPHECY, DARK AGES, CONQUER, OMEN, ENSLAVED, SAVAGES, and ARCHANGEL. In 2007, Rizzo became a member of CAVALERA CONSPIRACY, the side project of Sepultura co-founders, brothers Max and Iggor Cavalera, and has performed on all Cavalera Conspiracy releases including INFLIKTED, BLUNT FORCE TRAUMA, PANDEMONIUM, and the critically acclaimed 2017 release PSYCHOSIS. Also contributing to several of the aforementioned Soulfly albums, including PROPHECY and DARK AGES, was Megadeth bassist David Ellefson, who contributed bass to both releases and did some touring, which led to a connection to Rizzo, and the alliance with Ellefson’s reboot of legendary Metal label COMBAT RECORDS. Rizzo is also a part-time guitarist for COMBAT label-mates DEAD BY WEDNESDAY (first appearing on the band’s 2016 EMP release, THE DARKEST OF ANGELS), rounding out a label roster that also includes upcoming releases from legendary Metal acts RAVEN, HELSTAR, and WRATH. RIZZO will hit the road with SOULFLY (with NILE) in April and will enter the studio to begin work on the new Soulfly record in January.